Kokonuts Lounge and Tiki Bar: Kokonuts Lounge and Tiki Bar serves great daily drink specials, as well as a happy hour from 5pm to 7pm every day. You can enjoy a cocktail in the lounge or get a margarita on the pool deck. It is the hot spot for all your sunset celebrations. Childrens's program - There are several near by attractions and theme parks that are great for children. From Mote Aquarium to Busch Gardens and just across the street is the sugar white sands of Lido Beach. 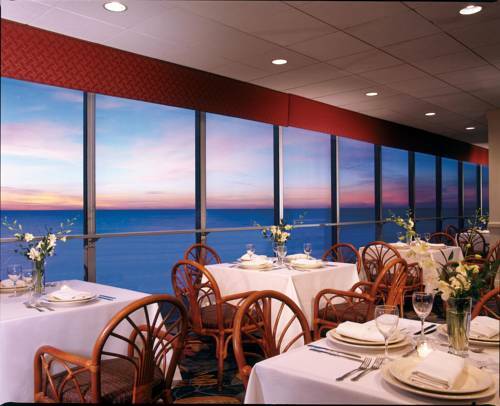 Sarasota Room: Located on the top floor of the hotel, newly renovated 1760 square feet of banquet and event space. Views of the city of Sarasota and the Gulf of Mexico. Golf Courses In AreaServeral Golf Courses in the Local Area. St. Armands CircleSt. Armands Circle features over 114 different shops, restaurants and galleries and is walking distance from the hotel. Ringling Museum of ArtIn 1911, John Ringling and his wife, Mable purchased 20 acres of waterfront property in Sarasota, Florida. Today, that investment welcomes visitors from around the globe with fine art, historic mansion, two circus museums and a jewel-box theater.